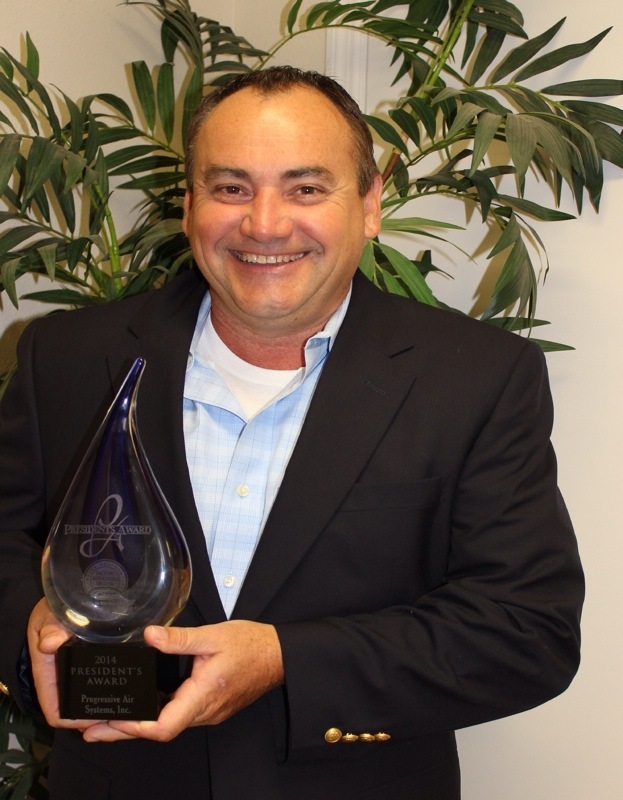 Progressive Air receives 2014 Presidents Award from Carrier! PORT RICHEY, FL.–Progressive Air Systems, Inc. recently received the 2014 President’s Award from Carrier in recognition of being an outstanding dealer in the heating, ventilation and air conditioning (HVAC) industry. Dealerships were honored at a ceremony held in Nashville, Tenn., on March 21. One of Carrier’s highest honors for its dealers, the President’s Award is given to Carrier® Factory Authorized Dealers who achieved excellence in product promotions and delivered superior customer satisfaction. Recipients of this award exemplify Carrier’s model for operational excellence, business effectiveness and delivering the best in cutting-edge technology to consumers. Progressive Air Systems Inc., demonstrates technical expertise, while also serving as a leader in promoting the Carrier brand and raising the standard for equipment sales. Moreover, the dealership is committed to service excellence and provides exceptional customer care. Progressive Air Systems, Inc. specializes in HVAC installations for residential new construction and custom homes, as well as service repair and change outs for existing residential homes. In addition, its employees have volunteered with local and national organizations such as Rotary International, American Cancer Society, Pasco Education Foundation, The West Pasco Chamber of Commerce, Sertoma and Pasco Kids First. The President’s Award is designed to encourage self-analysis and reward dealers who have excelled in customer satisfaction. This award presents the opportunity for recipients to serve as role models, share best practices and offer peer mentoring to help cultivate excellence across the dealer group. To learn more Progressive Air Systems, Inc. and its heating and cooling products and services, call 855-847-3898 or visit progressiveairsystems.com.